A meeting on the maintenance of park was held on Friday, 25 th of November wherein Mr. Jagbir Singh, Section Officer, Horticulture Deptt. DDA and M K Gupta, Jt. 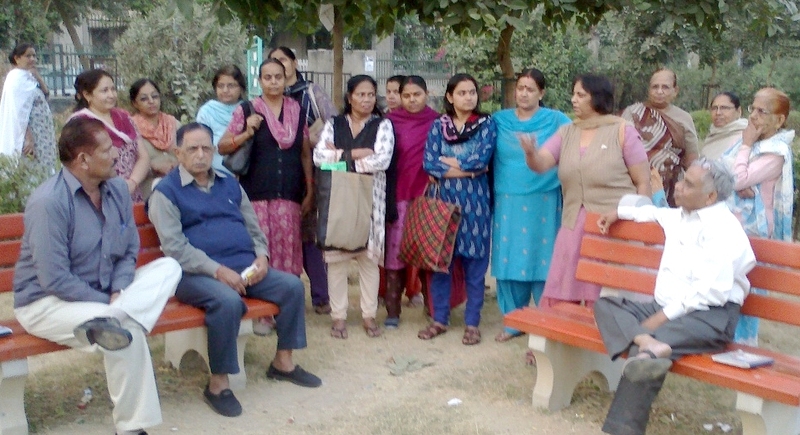 Secy, Dwarka Forum, Pradeep Bansal, J. K. Dahia, Nagpal ji and large number of park users including ladies have participated. Four gardeners were also present for this meeting. On a strings of complaints about the lack of maintenance like long absence of gardners, lack of pipes for watering, unsanitary conditions, over-grown grass on the walk ways, lack of trimming on a large areas of the park, lack of street lights and rainy shades in the park and so on were raised in this so called herbal park adjoining to Post Office market in sector 6. Mr. Jagbir Singh, DDA informed that the pipe for watering has been purchased, trimming of over-grown bushes and clearance of walk ways from over grass will be attended to with a fortnight. On further queries from Gupta, Bansal and others, he admitted that there was no pipe for watering the plants for over three month. He also said that the work of cleanliness of park is the part of the duty of gardeners and for this no separate staff is put on duties in any park. The duty hours of gardeners are from 9 a.m. to 5 p.m. Two watchmen are put on duty for watching all the parks of sector 6 and they perform their duties in rotation i.e. one from 5.00 p.m. to 1.00 a.m. and the other from 1.00 a.m. to 9.00 a.m. Mr. Jagbir also informed that he will have to check about the dress code for the gardeners and other field staff. About rainy shades and street lights, he said that these do not belong to the Horticulture Deptt. and for this, he informed the contact details of the concerned departments. He also shared his phone number with the participants. The meeting was held on the initiative of Shri Y. D. Sharma, Senior officer of the Horticulture Deptt. M.K. Gupta had earlier sent an RTI application on 13th Oct. about the maintenance of this park and the reply of the application is still awaited. Resident decided to meet on the issue of maintenance of park periodically.